In this volume, Karl Peter Wendt presents the first comprehensive results of a series of archaeological excavations carried out at sites of the earliest food-producing communities known in the Chad Basin of Northeast Nigeria: the so-called Gajiganna Culture. He describes the background of research, sheds light on the information contained in the stratigraphies of the sites examined, and offers exhaustive and advanced statistical analysis on technological, temporal, typological and ornamental aspects of the pottery recovered in course of research. After considering the ceramic sequence in its absolute chronological framework, the author makes an attempt to detect possible cultural relations between the Gajiganna sites and other archaeological locations both within and outside the Chad Basin. 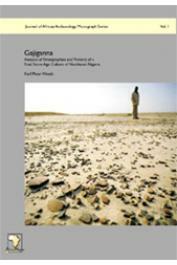 The volume is complemented by a photographic documentation of the Gajiganna pottery assemblages.